The famous Mexican painter Frida Kahlo was known for her striking indigenous Mexican apparel and jewelry, but she was not a fashion symbol of her time. Here's a brief comparison of the jewelry worn by the real Frida Kahlo and that featured in the 2002 film, "Frida." Today, much of Frida's jewelry is on display at the Frida Kahlo Museum in Coyoacan, Mexico. It's located inside Frida's family home, La Casa Azul, and exhibits include Frida's bedroom, some of her artwork and her art studio. If you're in the area, consider paying it a visit. No photography is allowed inside the museum, and I've been unable to find any recent photographs of Frida's jewelry. However, we know that Frida favored Pre-Columbian adornments, or pieces handcrafted by native Central American Indians before Christopher Columbus landed on America. She included some of these necklaces and earrings in her renowned self portrait paintings, and at times her jewelry can be made out in old, grainy black and white photographs. Her earrings were elaborate drops or dangles in the traditional Mexican style, and her necklaces often featured roughly-hewn, handmade stone beads and pendants. These styles were popular in early Central America; they were not "trendy" or in fashion at the time of Frida's life. For Frida, they represented cultural tradition, and she wore them largely as a political statement. In fact, it's been said that Frida sometimes was the brunt the jokes when she walked in public in her showy, traditional Mexican outfits and gaudy pre-Columbian jewelry. But this look, which included over-the-top traditional Mexican hair styles, was deliberately crafted by Frida as a backlash against new trends and a message of cultural preservation. It's still possible to find examples of Pre-Columbian jewelry for sale today. Much of it has been unearthed during archeological digs and placed on the market. However, the most beautiful, authentic Pre-Columbian beads and pendants are considered collector's items and can be quite expensive. 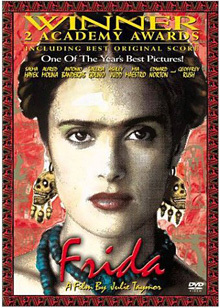 Salma Hayek plays the role of Frida Kahlo in the Hollywood film Frida. Salma's costumes and jewelry are stunning, and she is a gorgeous actress who wears them well. Costume designer Julie Weiss purchased much of Salma's jewelry from modern-day street vendors in Mexico City. The collection includes big earrings with coral or pearl drops, floral motifs, and necklaces both long and short with lots of bold beads or links of hammered gold. One particularly notable necklace boasts large, round beads which appear to be carved from amber. As lovely as this jewelry is, most of it is probably not jewelry Frida would have worn. This concerns some commenters, who believe the persona of Frida Kahlo has become far too commercialized - even to the point of creating an unbecoming Mexican-woman stereotype. It's true that Frida, a staunch communist, probably would not support this kind of commercialization, and I do not agree with stereotyping based on gender or nationality. At the same time, I believe it's OK to be influenced by the jewelry featured in a film like Frida, as long as we take it for what it is - not necessarily representative of the real Frida Kahlo. I personally loved the Frida jewelry for its color, boldness, and sense of style. If you'd like to find some similar designs for your own collection, probably the best place to find them is Mexico City itself. You'll likely find excellent deals on jewelry just as beautiful as that found by Julie Weiss. The keys to this look are bright colors (think of the bold colors Frida Kahlo used in her paintings) and striking large or layered pieces. Gold tone metals will create a richer, more elegant look than silver tones. If you can't travel to Mexico, try searching for Mexican jewelry on the Internet or for Mexican imports in your local area.